Get ready to throw it away or throw it out there! San Francisco's unique Disposable Film Festival (DFF) was created in 2007 by Eric Slatkin and Carlton Evans to celebrate the artistic potential of disposable video: short films made on non-professional devices such as one-time use video cameras, cell phones, point and shoot cameras, webcams, computer screen capture software, and other readily available video capture devices. What do they mean by "celebrate"? They explain on their website: "In recent years a new kind of film has emerged: The Disposable Film. It has been made possible by new media and the rise of online distribution (Vimeo, YouTube, Facebook, etc.). These films are often made quickly, casually, and sometimes even unintentionally. Everyone has become a Disposable Filmmaker: directors of Saturday night cell phone videos, actors under the eyes of security cameras, and narrators before their webcams. Let's face it—we live in an age of disposable film. Now it's time to do something creative with it." 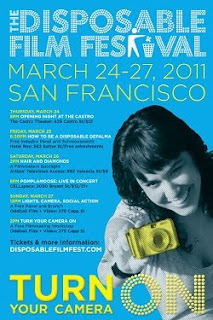 DFF Promo from Disposable Film Festival on Vimeo. Moving into their fourth edition after a dizzying year of Bike-Ins, panel discussions, and new partnerships, DFF feels bigger and better than ever as they switch premiere venues to the hallowed Castro Theater (which straightaway annoints a festival with credibility). DFF kicks off the weekend's events with their Competitive Shorts Night on Thursday, March 24 (advance tickets available here), continuing through the weekend at Artists' Television Access (ATA), CELLSpace, and Oddball Film + Video. Check out the full schedule here. Selected by Moviemaker Magazine as San Francisco's "coolest" film festival, DFF amps it up this year and adds celebrity judges Ted Hope (Dark Horse) and Matthew Lessner (The Woods) to a film panel that includes festival veterans Hawk Ostby (Children of Men, Ironman) and Blake Whitman (Vimeo.com), partners with PlayStation Home to simulcast 2011 material, and hosts a party with YouTube sensation Pomplamoose. DFF's 2011 premier will boast more creative narrative work and other techniques thanks to the array of new devices such as the iPhone 4, DSLRs, Kinect and more. Highlighting the new accessibility of filmmaking today, DFF's program will feature a competitive shorts program and other screenings, a featured filmmaker profile of Philadelphia-based artist and filmmaker Christopher P. McManus in conversation with Vimeo's Andrea Allen, Q&As, a community-based social gaming networking simulcast, educational workshops, multimedia performances, and after parties. Saturday's afternoon profile of Philadelphia-based filmmaker Christopher P. McManus will take place at ATA (2:00-5:00PM; tickets: $6 at the door). McManus's Hair and Diamonds series has shown all over the world, including London's Tate Modern. Later that evening at CELLSpace, DFF hosts an event of interactive media and live music by indie duo and YouTube sensation Pomplamoose. Tickets are $12 and can purchased in advance here. DFF wraps on Sunday, March 27 with a robust educational panel and workshop at Oddball Film + Video.